If you want to make brand messages that stand-out, then rectangle stickers are a good medium. 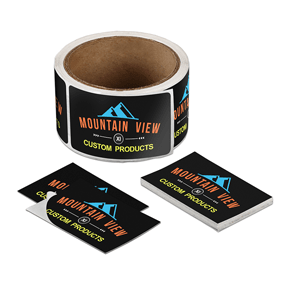 Whether you are branding your product packaging, creating thank you stickers, or simply campaigning for your business with promotional decals, you can never go wrong with sticker printing. Aside from business branding, you can even design them for personal gift tags, decor and just for fun since they provide a fun canvas for your designs. Make a great impression with personalized rectangle stickers. Print in color and customize with any of our options like an additional glossy or matte coating, and rounded or squared corners in various configurations. Choose from a wide range of sizes and paper types depending on your needs. Our rectangle stickers are available in both cut-to-size and roll formats. For individually cut rectangle stickers, you can choose from 1.5" x 2.5" up to 8.5" x 11" sizes. For rolled, you can choose from 0.5" x 1" up to 6" x 6.5". All of our stickers are made with top quality materials. Order from 100 up to 100,000 in one order. Send us your design or use our online design tool to create a new one from scratch. After approving your design proof, they will be ready for shipping as soon as the next day. Rectangle Stickers is rated 4.7 out of 5 by 51. Rated 5 out of 5 by Silverphox from Exactly what we needed in a pinch! Fast accurate and great sticker product for the new song launch “Young Love” by the band “Pushing Veronica”. Thank you we’ll do business again! Rated 5 out of 5 by GED1 from AMAZING Welcome Box Stickers! I created my own rectangular stickers to put on gabel boxes for my wedding weekend - they looked like I paid triple the amount that I did for them! The free proofing service is amazing and so easy. I will definitely use again for future needs. Rated 5 out of 5 by Mine from Very happy I am very happy with our stickers, they look great and were delivered so fast.